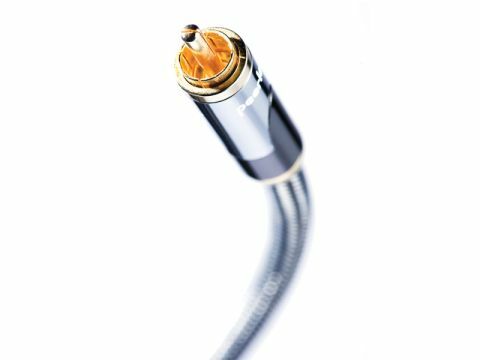 Peerless is an American company that majors in stands and mounting systems for AV components, but it includes a moderately wide range of cables in its lineup. The Sigma products are the current top of the range. This particular model is a straightforward coaxial design, along the lines of good-quality industrial RF cables: it has a stranded core of silver-plated copper, foamed polythene insulation and a notably robust screening assembly with four layers – aluminium foil, braided copper, more foil, more braid. That should help keep interference to a minimum, at least, though the inevitable compromises of phono plugs will slightly spoil the effect at high radio frequencies. The jacket is fairly soft and a fabric braid is applied over the cable for mechanical strength, completing an assembly eight millimetres in diameter and moderately flexible. We found the Sigma an excellent interconnect, producing finely detailed images when hooked up between various sources and amps. It has a very even tonal balance, too, with perhaps just a touch of excess in the bass at times, but despite that there is very good control in the lowest octaves and low instruments are very well defined. The treble is open and clear, with very good, natural decay of sounds into ambience, something that can easily be ‘dried out’ by poor interconnects and there’s a real sparkle on intrinsically bright sounds like cymbals and violins. Perhaps image depth isn’t always the best defined, but by the normal standards of sub-£100 interconnects this is something of a star performer.